Jodhpur - Jaisalmer with Bikaner is a short break itinerary that explore three popular Desert circuit destinations of Rajasthan (Jodhpur (Craft Village, Fort, Temples), Jaisalmer (Fort, Sand Dunes, Temples) and Bikaner(Forts, Palaces, Temples). Jaisalmer is the main attraction of Desert Rajasthan. The city of Jaisalmer is famous for its exceptional monuments, desert and historical haveli. Tourists and history freaks have endless love for the city. This trip will take you to almost of Rajasthan in short duration including Jodhpur, jaisalmer, Bikaner which is Known for its history, culture, scenic locations and the Rajputana times. It is surrounded by Aravalis - India's oldest mountain range and some part is covered by Thar Desert. Handicrafts, Royal palaces, Wild Life, Bird sanctuaries, puppet shows, traditional art and culture, prominent structures that represent the architectural heritage, Havelis, Forts & Palaces, Temples. Arrived at Jodhpur Pickup from Jodhpur Arrival / Railway Station by our representative and transfer to your respected Hotel and after wash & Change visit to Mehrangarh Fort, situated on a low sandstone Hill, including Moti-Mahal and Phool Mahal. Also visit Jaswant Thada, an imposing Marble Memoriam built in 1899 and the museum located in the Umaid Public Gardens and local market of Jodhpur. Overnight at hotel. After breakfast visit Clock Tower and drive to Jaisalmer in evening reached at jaisalmer and visit the manmade lake (Gadisar Lake) Rest of the Day at leisure. Overnight at hotel. Morning visit Jaisalmer Fort, Bazars and the old mansions known as "Havelis". People still live in these ancient buildings dating from 12th to 15th century. Every house has exquisite carvings and filigreed work. Evening visit sand dunes. Overnight at camp. Early morning after breakfast drive to Bikaner. 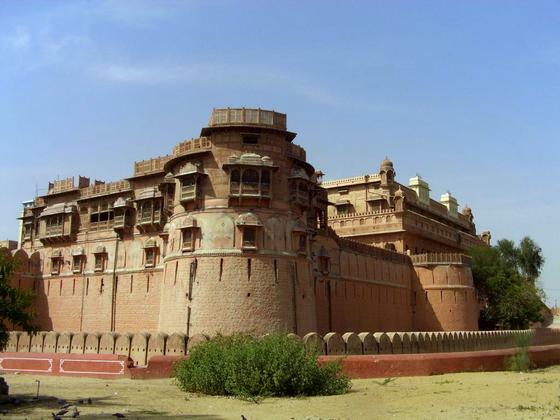 Evening city tour of this desert city, Bikaner is bolstered by imposing walls and has a 16th century fort housing old palaces, temples and a mosque. Founded by Raja Rai Singh, the fort is distinguished by its long range of 37 pavilions, a line of balconies and aerial windows of varying designs. An enormous arched doorway leads to the Joramal Temple. The royal chapel is Har Mandir where royal weddings and births were once celebrated. Overnight at hotel. After breakfast proceed for half day sightseeing We begin our tour with the formidable Junagarh fort. The fort complex has some of the most magnificent palaces, like Anup Mahal, Ganga Niwas and Rang Mahal. Later transfer to Airport/ Railway station to onward journey.